For awhile now, I’ve been craving sushi. Between engagements, typical and a-typical financial obligations as of late, I haven’t been able to satiate that desire. As it turns out, I simply didn’t know where to go – or had nowhere to go before sugarFISH opened up in Downtown LA a few days ago. Quality fish without the scene or price tag is a rare find, and I’m lucky to have been invited by Lele Massimi, one of the founders, to see exactly what they were up to. After all, this kind of research is expensive. SugarFISH will now be my home base. Fish is bought dailyÂ from the fish market just down the street – a claim that the Brentwood, Marina del Rey and soon-to-be Santa Monica locations can’t make.Â Even when that market is closed on Sundays,Â Kazunori Nozawa still hand-picks each cut from the fishermen because he’s an insider (you may know that his reputation precedes him). This is the same fish that you would order for double the price at Sushi Nozawa, and here you will often have first choice of the rarest finds from the marketÂ because of this outpost’sÂ vicinity – just ask what the special is.Â Sitting at the sushi bar isn’t an option – because there doesn’t exist one. SugarFISH is able to sustain – and flourish – at these prices by cutting out the middle-man and preparing all food within the confines of their kitchen. The fish that I tasted was all excellent, though I may have preferred less ponzu in my first round of nigiri. 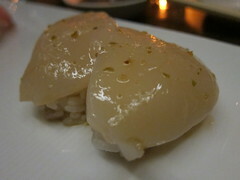 The second round, however, was a good progression and I was treated toÂ large and silky sea scallops with a yuzu-ponzu sauce – one of my favorites. 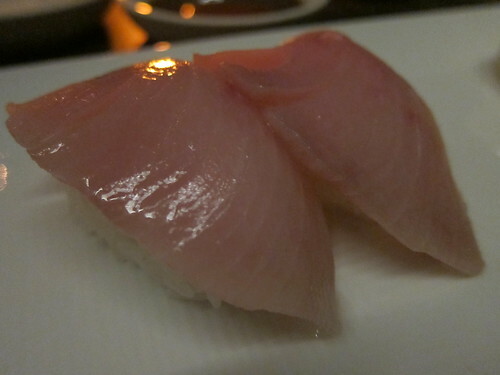 The yellowtail nigiri at sugarFISH is the freshest I’ve had in recent memory. The rice was warm and loosely packed so that all ingredients seamlessly melt in your mouth. The portions of spectacular fish are generous, contrary to other piecemeal sushi “deals” I’ve come across. 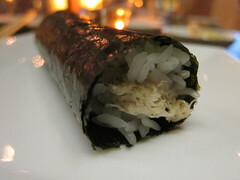 Then came the temaki, or hand rolls, wrapped with shiro seaweed. It packed an unusual, crisp crunch, as I was prompted by Lele toÂ eat it quickly (with a time cap of 90 seconds) lest the seaweed absorb the vinegar from the sushi rice, becoming soggy. The toro and blue crab versions were both perfect. The toro was tender and fatty while the blue crab did not have that salty aftertaste I’ve often experienced. When all was said and done, I could not believe the quality of theÂ edamame, tuna sashimi dressed in ponzu, 2 rounds of nigiri and 2 hand rolls I just experienced would cost a diner a mere $37 before tax and tip. We also tried the oyster sashimi, in which we got four pieces for their more-than-reasonable price of $5.75. The sauce in which it sat was a stripped-down soy, a perfect complement that didn’t interfere with the creamy characteristics of the oysters. 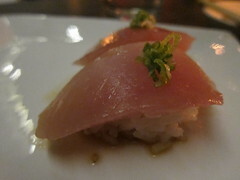 We were easily full after The Nozawa, what is dubbed the top tier omakase at sugarFISH. The smaller portions are called “Trust Me” ($28.50) and “Trust Me Lite” ($19.50) – both available for lunch to the joy of Downtown LA office workers. And, as further proof that sushi is the priority here, there is no dessert menu and there is a 16% automatic service charge – thereby taking out the distractions andÂ guesswork in your dining experience (and affording you a less-than-industry-standard tip). This 3rd outpost of sugarFISH, like its counterparts on the westside, also expects its clientele to be 50% comprised of regulars. No frills and no nonsense, just reliably outstanding sushi. I think they can count me in. SugarFISH Downtown LA is currently open for soft launch. It officially opens on Thursday, October 28, 2010. All food and sake were hosted. 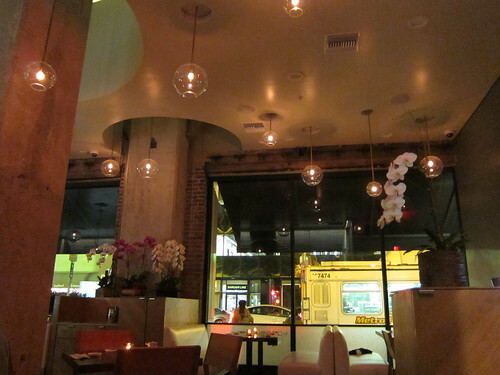 This entry was posted in Deals, Downtown LA, Food, L.A. and tagged affordable, blue crab, Downtown LA, downtown los angeles, DTLA, fish, hand roll, Kazunori Nozawa, los angeles, nigiri, omakase, ponzu, raw fish, scallops, sit-down, sugarFISH, sushi, Sushi Nozawa, temaki, The Nozawa, toro, Trust Me. Bookmark the permalink.